The Outlook Cabana offers indulgent accommodation for couples wanting the perfect romantic spot, a dreamy seaside escape with ocean and bush views… or a carefree holiday. The 1 level room overlooks picturesque Avoca Ocean, and 18 acres of extensive gardens filled with bird life, sheep and horses grazing. The property allows you to take short bush walks, kayaking on Avoca Lake, swim in a stunning infinity pool or enjoy a BBQ dinner on your private sundeck. Located in the heart of Terrigal, within metres of the sand and offering spectacular uninterrupted views of Terrigal beach and the magnificent Pacific Ocean, limited only by the horizon. Fully air-conditioned apartment with security parking and only a minute’s walk from fabulous restaurants and cafes. Accommodates up to 8 people. There are three spacious bedrooms, two with ensuite bathrooms, verandahs to all bedrooms. Luxuriously furnished with suede lounges, hardwood dining table, plasma TV, DVD player. Huge lounge room with polished Tasmanian oak floorboards, opening to sun drenched outdoor patio with BBQ and spectacular beach views up the coast. 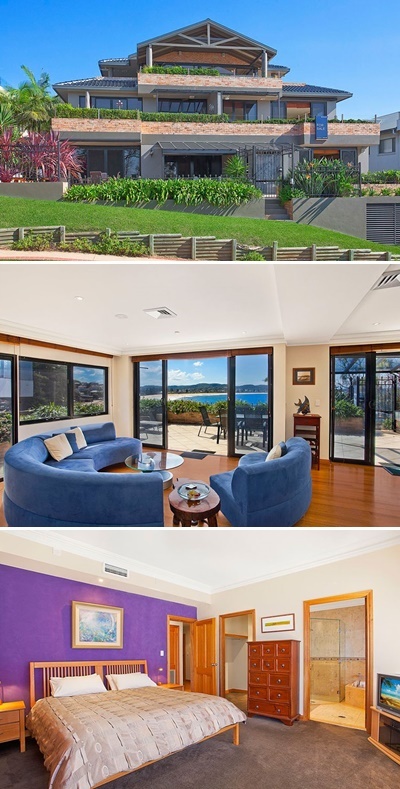 With private entry access from the Esplanade, you cannot be much closer to the waterfront in Terrigal. A weekend at Ned’s Beachouse might be what you need. This home backs onto the third tee at Shelly Beach Golf Club and has easy access to Shelly Beach. The property has two pavilions and they are offering the west pavilion for your stay. You will enjoy wonderful lake and ocean views with very comfortable accommodation for six. The property includes a large all weather patio, barbecue and a very unique architectural experience.